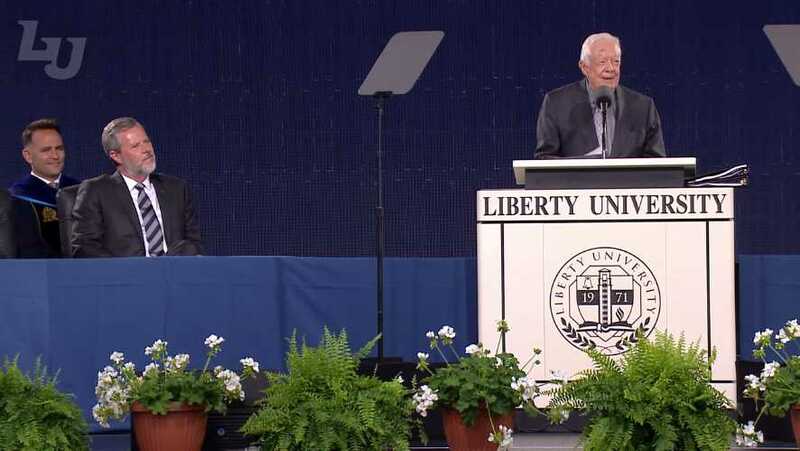 LYNCHBURG, Va. — Jerry Falwell, Jr., the president of Liberty University, which hails itself as the world’s largest Christian university, says that he is writing a book with former Democratic President Jimmy Carter, the specifics of which have not yet been announced. Carter, who has publicly expressed his support for “gay marriage” and says that he believes in evolution, claims to be a born again Christian and teaches Sunday School in Georgia. Last year, he advised liberal op-ed columnist Nicholas Kristof that he can’t judge whether or not someone is a Christian despite their doubts about Christ’s virgin birth and resurrection. “One of my problems with evangelicalism is that it normally argues that one can be saved only through a personal relationship with Jesus, which seems to consign Gandhi to Hell. Do you believe that?” Kristoff also asked. “I do not feel qualified to make a judgment. I am inclined to give him (or others) the benefit of any doubt,” Carter replied. Despite his beliefs, Carter still refers to himself as a born-again Christian and teaches Sunday School at Maranatha Baptist Church in Plains, Georgia. He spoke at a Liberty University Commencement in May, sharing his thoughts about global concerns such as human trafficking and the threat of nuclear war. As previously reported, Falwell has been a vocal supporter of President Trump since January 2016, repeatedly asserting throughout Trump’s presidential campaign that the then-candidate bears the fruit of one being born again because of his characteristic good deeds. Falwell contended that those who expressed concerns about Trump’s behavior were violating the “judge not” clause in Matthew 7:1. “Jesus said, ‘Judge not, lest ye be judged. Let’s stop trying to choose the political leaders who we believe are the most godly because, in reality, only God knows people’s hearts. You and I don’t, and we are all sinners,” he said in an interview with the Liberty University newspaper in March 2016. In October 2016, when some Liberty University students denounced Trump as being antithetical to Christianity after sexually-charged remarks surfaced from 2005, Falwell asserted that, in their immaturity of youth, they were wrongfully “ignoring” the teachings of Jesus on judging. “This student statement seems to ignore the teachings of Jesus not to judge others, but they are young and still learning,” Falwell stated, in part, in response.